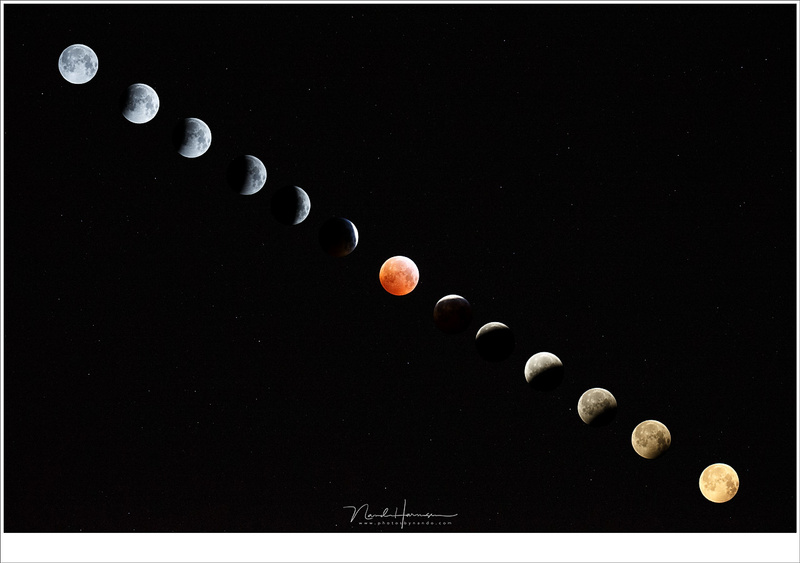 Was the Superbloodwolfmoon Really That Spectacular From a Photographer Point of View? 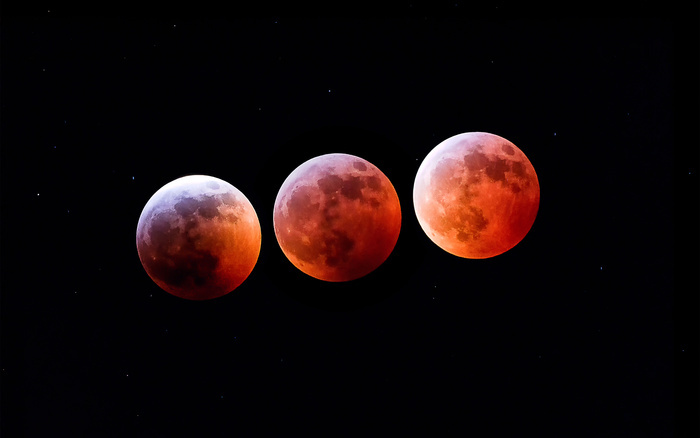 It was all over the news; the superbloodwolfmoon of January 21st 2019. It was special, it was very rare, and it was spectacular. Or so they said. But was it really that special and did it show on the photos that I took during the four hour eclipse of the Moon? Let me tell you my story. 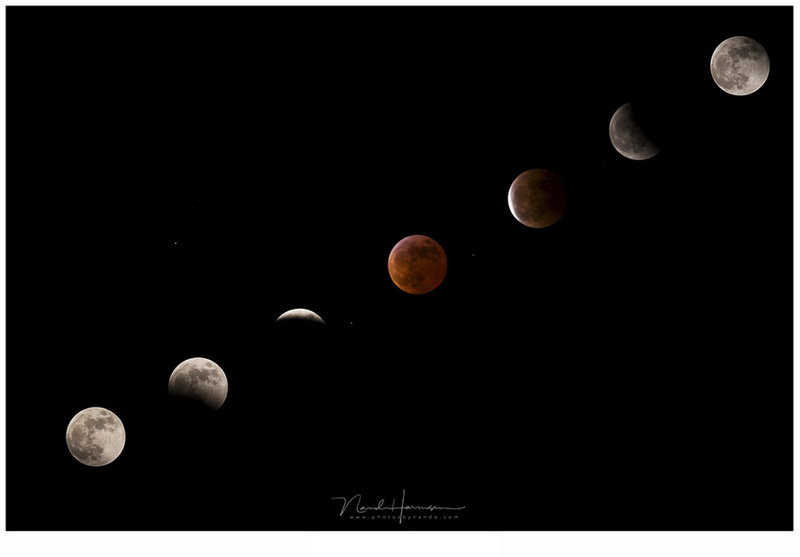 You can say I have some experience with photographing a moon eclipse. 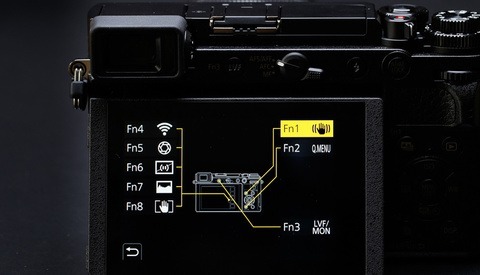 The first one I tried was in the analogue days, in another millennium. Those slides are somewhere in the attic, forgotten and probably lost. It was 2007 when I pointed my first DSLR towards a moon eclipse, and a second time in 2008. In those days you had to look hard for news about such an event and it was quite rare when you found such an image in the photo communities. It is only in recent years we hear in the news about super moons, blue moons, harvest moons, wolf moons, and blood moons. Everything about night sky and astronomical occurrences have grown in popularity, of which photography is probably partly responsible for. It is wonderful these events get attention, because I think the public has not really looked up into the night sky for many years. Thanks to these news items the public is again becoming aware of the wonders we took for granted or even had forgotten. But is it as spectacular as the news always suggests? Or is it just the search for sensation? I noticed this when the eclipse of 2018 brought some disappointment to some, thinking it would be much more. What are those blue moons, harvest moons, and wolf moons? 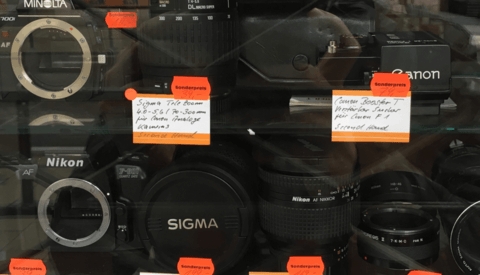 Well, all those names are nothing but… names. 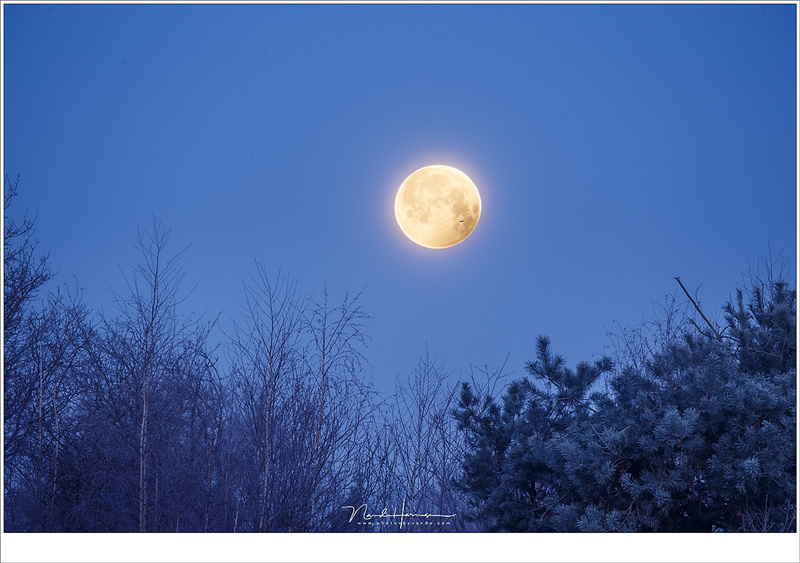 The moon doesn't look blue during a blue moon, the name harvest moon isn’t something special, and the wolf moon is only the name given to first full moon in the January. When photographing any of these full moons you end up with the same full Moon you see every lunar cycle. There is no difference at all. 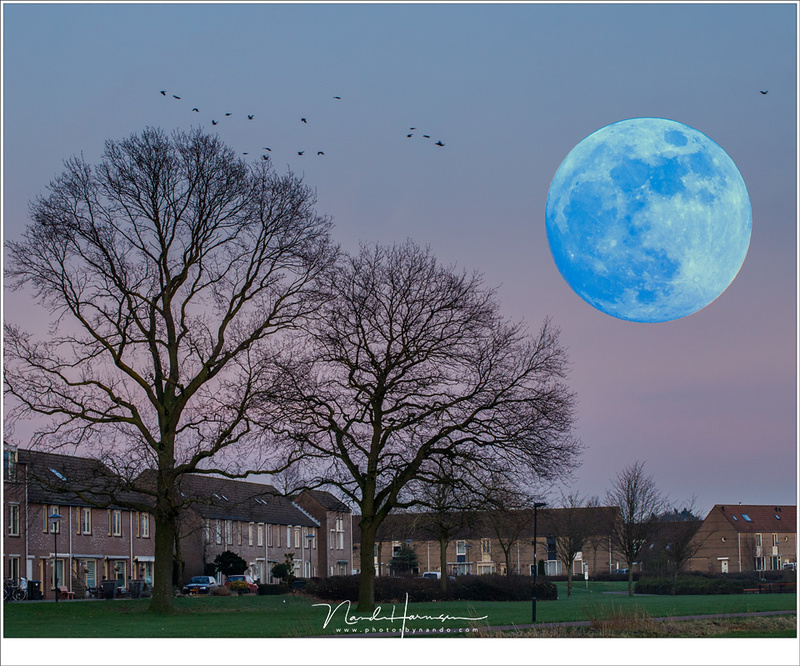 In January 2018 there was a blue super moon, something really special and rare according to the media. I had to rely on Photoshop to make the Moon really blue and super large. 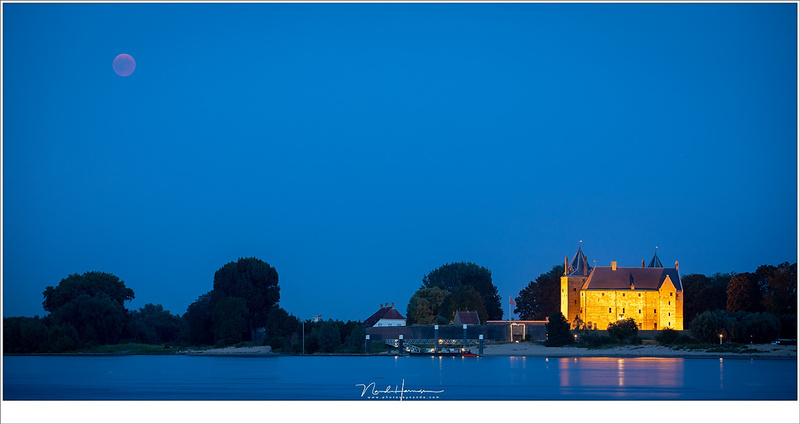 Both images are taken right after each other, the foreground setting with 100mm and the Moon with 400mm focal length. But a super moon is something real. The orbit of the Moon isn’t a circle and sometimes the moon is closer by than other times. 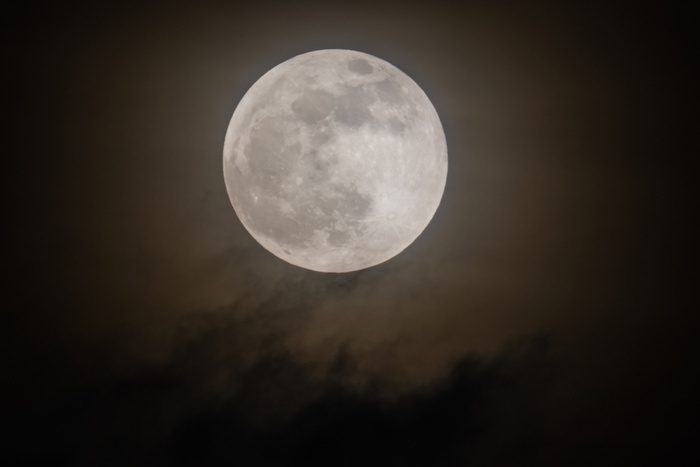 When its closest approach falls together with a full moon we have that famous super moon. But the difference isn’t that spectacular as we are made to believe. On its closest approach the moon is not more than 14% larger compared to the moon on its largest distance. And it is approximately 30% brighter. Unfortunately we cannot see that difference in brightness or angular size and the reason is simple. Every night the moon becomes a bit larger and brighter until the moment when it is a super moon. So the growth is gradually and slow. We don’t have a small moon one night, and a 14% larger moon the next. And on top of that we have the phases of the Moon, so we don’t really notice that a full Moon is sometimes larger and brighter than other times. The size of the moon in a photo is mostly determined by the focal length instead of the angular size, and the brightness is determined by exposure settings. 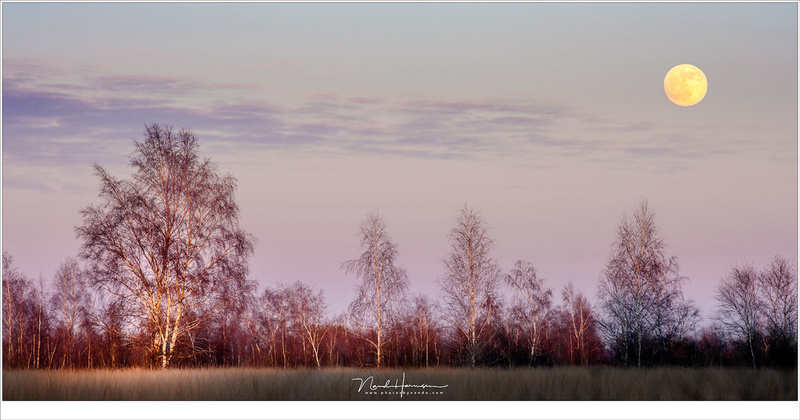 If you want to have a real super large moon in your photo, you can get one every month, just by using a very long focal length and something on the horizon to have a size comparison. 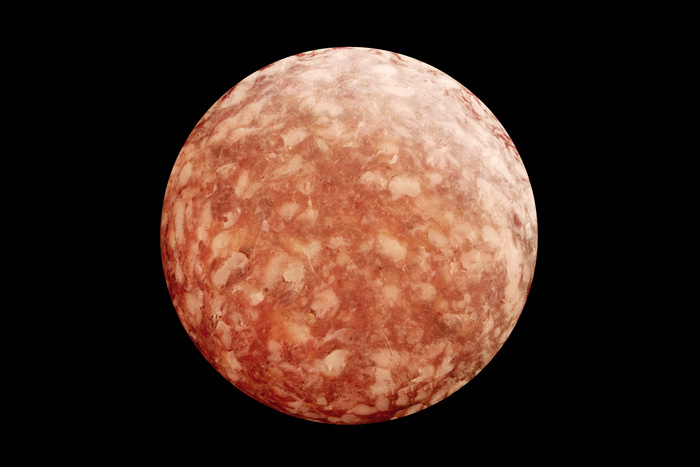 The blood moon, on the other hand, is something else. This one is unmistakably recognizable in the photo. And of all the names we like to give to the moon, this is the only real special one. 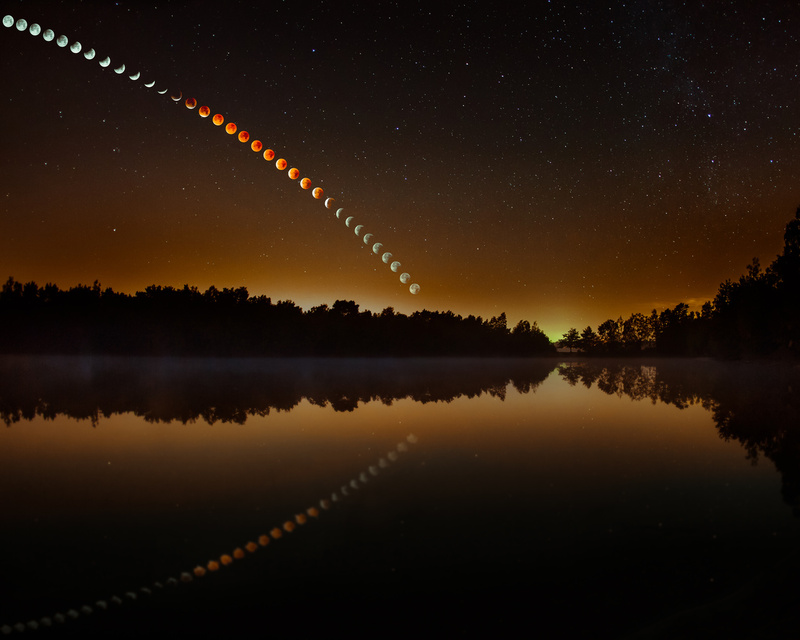 The red color, produced by the bending of red light in the Earth’s atmosphere, and how the moon slowly enters that realm of the Earth’s shadow, is very impressive. 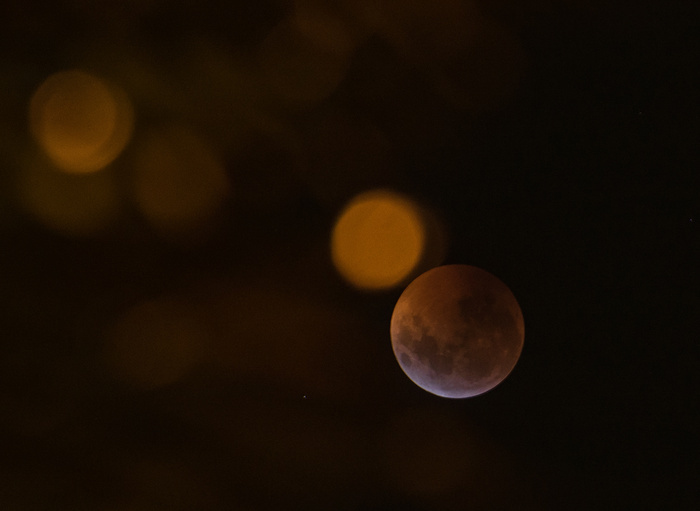 What is even more special is how the stars surrounding the Moon become visible when the eclipse reaches totality. 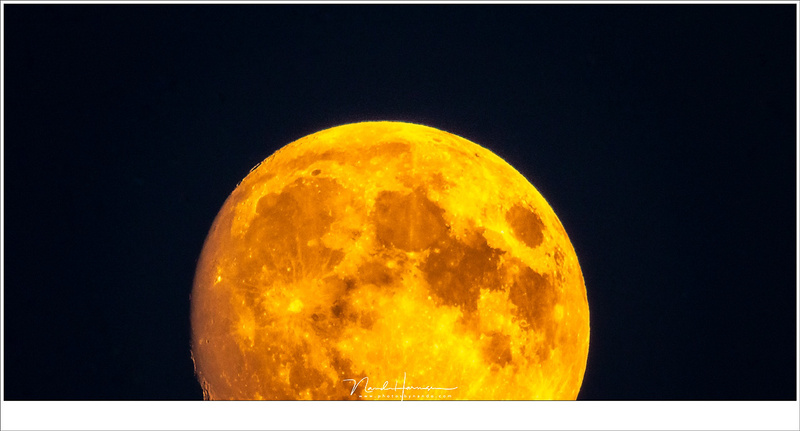 When this event happens during a super moon it can be called rare and very special. And on January 21st 2019 it happened also during the first full moon in January which is called the wolf moon. And thus we can give this eclipse that very, very rare name superbloodwolfmoon. But the only thing we can recognize in the photo is the blood moon. I made a time-lapse of the eclipse of January 21st 2019 with a 16mm wide angle lens on a Canon EOS 5D mark IV, with one frame every 30 seconds. Should we ignore the hype of a super moon, or wolf moon, or whatever special names have been given to the moon? Of course not. So go out and photograph that amazing natural satellite any way you can, and always try to that when it is low at the horizon, with a beautiful foreground so you can see how large it can be. But we always have to be aware these beautiful names don’t give another appearance to the moon. In other words; don't wait until someone tells you it is a harvest moon, or blue moon, or whatever. That makes no difference. 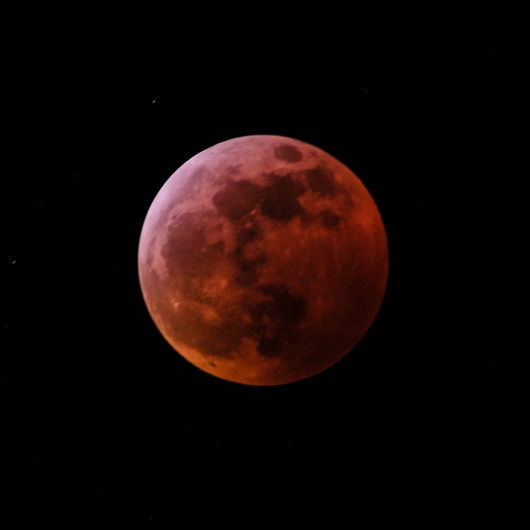 But every time you get the opportunity to catch a blood moon, you should take the opportunity to go out and photograph it, even if the images look exactly the same as the previous eclipses, like I have experienced with the eclipses of 2007, 2008, 2015, 2018, and this one in 2019. The next blood moon will be in 2021 and is only visible nearby Antarctica. 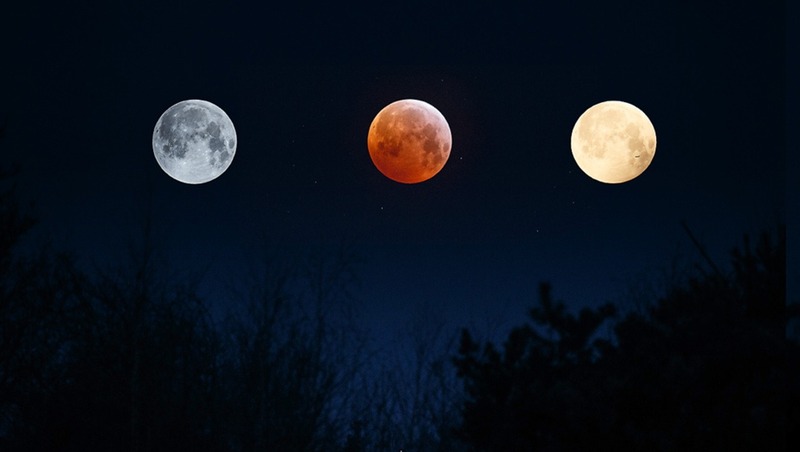 Unfortunately we in the Netherlands and Belgium will have to wait until 2029 before the next blood moon will be visible. 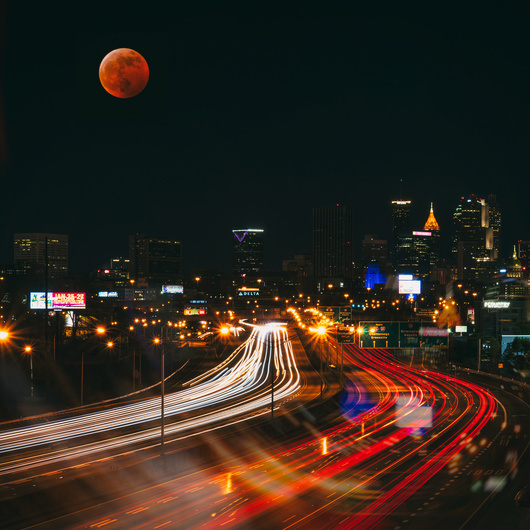 The most special moment for me this year was after the blood moon ended. 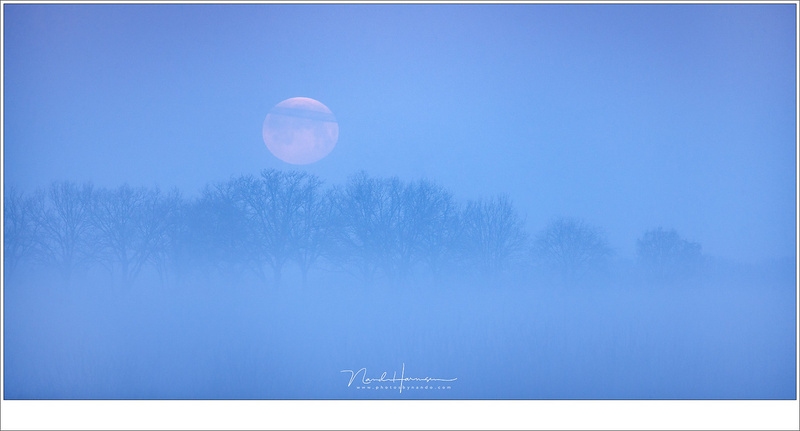 The moon set during twilight when fog covering the icy cold blue landscape. Now that was really super. 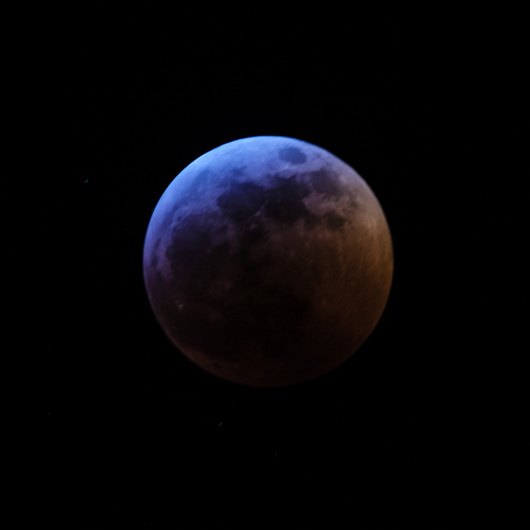 Please leave a comment down below and tell me if you have photographed the eclipse of 2019, and did it live up to your expectations?. The best thing about a super moon is the effect it has on tides. 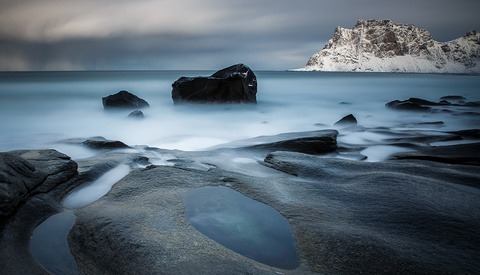 Super low tides create great photo ops among the sea stacks. Does a super moon really have a noticable effect on tides? I realize this reply is a month late but...yes, it does. The closer the moon is to the earth the more it affects the tides. You typically get the highest and lowest tides of the year around a super moon. I used to plan my annual week at Oregon coast around it. Nice. Did not realize that. But now I guess this is spring tide? As an amateur astronomer, I cringe every time someone (or a media) gets excited about the "super moon" or the "blue moon" or whatever. Calm the f*** down, it's just a full moon and you wouldn't notice the difference if nobody told you. In fact, it happened all time during your whole life and you didn't notice. It's just insufferable media hype and clickbait names. And also, please stop with that "blood moon" crap. What is this, the middle ages? It's called a total lunar eclipse. Being an amateur astronomer and a reformed astrophotographer, I always keep in mind that we are a very, very small minority. Relatively few people know M42 from an M1A1 main battle tank. Have you ever done an outreach event? Ever notice some of the questions? Most people don't know that a light year is about 5.5 trillion miles. I applaud the media, a rare, rare event for me, when they let the non-astronomers know that something's going on out of the norm. If it requires a bit of hype to get people to look up, so be it. Back in the 80s when Halley's Comet was making it's latest pass, the sales of telescopes and binoculars skyrocketed. Imagine had the media not mentioned the passing. How many people would have never discovered the wonders of backyard astronomy? Remember the first time you saw Saturn through a telescope? I do. I was 8 years old standing in a farmer's field looking through a 4 inch refractor. Many, many years later, I was at an outreach event with a 12" Meade SC. I had Saturn in the eyepiece. A lady was convinced that I had a picture of Saturn in the scope. I ended up slewing the scope around to show her that it wasn't a picture. It's especially important to get kids interested in what's up above. If calling the last eclipse a 'blood moon' makes that happen, I'm all for it. I don't mind when there is a enthusiastic article about anything related to this, but they tend to exaggerate a lot, making it bigger than necessary. Now people react on it, but if they get disappointed every time, they will ignore it eventually. It's always irritating when the media blows "supermoon" events out of proportion. Then you have Facebook pages with names like "I F***kInG LOVE ScIeNcE!" creating BS infographics that are virally shared and often contain false claims about the event. On the upside, it gets more people to pay attention to astronomy which I fully support. Not really. Went to take some shots and came back with none. But enjoyed looking at it though. No shots at all? But it is good you enjoyed it. i had more fun taking advantage of the cloud cover in my area than with the actual eclipse itself. It was my first one that I ever photographed. I was lucky to have one of the founders of National Parks at Night Gabriel Bidderman http://www.nationalparksatnight.com/ as my guide during a conference in Atlanta, GA super late at night. I'm extremely pleased with the results. Captured with my Nikon Z7 and 70-200 with 1.4x adaptor. We found a cool overpass to set up our cameras. I really like this one. Was the Moon really that low in the sky and that size? I think the spectacular is the eclipse phenomenon. This is the most interesting thing I took when I passed near my palm tree. Ops I forget to upload more reds !. Yes, there are lies that everyone likes to take for granted. I overslept and had to hack something together.